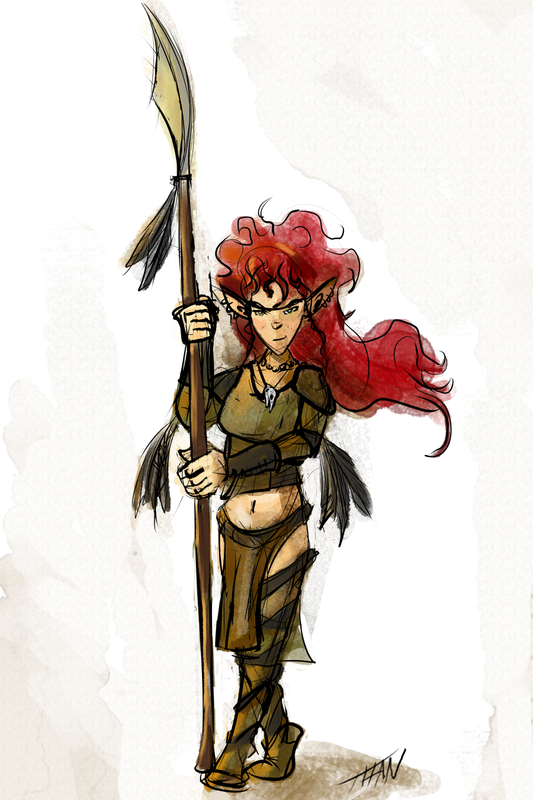 The Saysyn (pronounced say-yih-syin), or "wild elves", on the other hand see their role as the guardians of The Wild and live in the untouched primal places deep in the woods. They build simple tree villages where a few clans gather together. All Saysyn clans have a totem spirit animal that guides them and reminds them of their connection with The Wild. Physical Description: Saysyn have a defined, lithe physique of toned muscle on a compact frame. They tend to be shorter than their highborn cousins with a more tanned complexion. Their eyes, however, are the same large, vibrant colored eyes as their cousins. Society: All elves feel a bond with nature and strive to live in harmony with the natural world. Saysyn live off the land and in close communities, with their innate resourcefulness making them well-suited for rangers and druids. The largest Saysyn settlement was Saque (say-kyay). A city built into the tops of ancient trees with a colossal oak at its center, it was said to be a true wonder. The great city burned in an event only referred to as The Night of Fire and Betrayal. Relations: Celasyn and Saysyn treat each other with mutual disdain. Both cultures believe that the other has strayed from Belagaea's Calling of "Guard The Wild." As such, they are automatically Unfriendly to each other in starting attitude unless otherwise noted. Saysyn view all outsiders with suspicion. They keep good relations with the fey and do enjoy the company of halflings. Monstrous races are treated with hostility. Alignment and Religion: Elves are emotional and capricious, yet value kindness and beauty. Most elves are chaotic good and follow Belagaea, the Mother of the Wild. Adventurers: Many Saysyn embark on adventures out of a desire to explore the world, leaving their secluded forest realms to see what lies beyond their wooded borders. Saysyn are more prone to melee combat than their highborn relatives. Many are very adept at polearms and spears. Their tenacity makes them perfect for barbarians and rangers. In Chronicle, there are some differences between the races and their Pathfinder Core Rulebook counterparts. Presented below is the Saysyn Race entry for the Chronicle Campaign Setting. +2 Dexterity, +2 Constitution, -2 Intelligence: Saysyn are sturdier than their Celasyn cousins. Medium: Saysyn are Medium creatures and have no bonuses or penalties due to their size. Normal Speed: Saysyn have a base speed of 30 feet. Low-Light Vision: Saysyn can see twice as far as humans in conditions of dim light. Elven Immunities: Saysyn are immune to magic sleep effects and get a +2 racial saving throw bonus against enchantment spells and effects. Totem Animal: Saysyn choose a Totem Animal from the Totem Animal List below to represent their clan. They receive the bonus that the Totem Animal grants. Keen Senses: Saysyn receive a +2 racial bonus on Perception skill checks. Weapon Familiarity: Saysyn are proficient with longbows (including composite longbows), longspear, shortspear, and shortbows (including composite shortbows), and treat any weapon with the word “elven” in its name as a martial weapon. Languages: Saysyn begin play speaking Elven and Sylvan. Saysyn with high Intelligence scores can choose from the following: Celestial, Common, Draconic, Gnoll, Gnome, Goblin, Orc.